TOP pacer Harjeet faces an astronomical task in his title defence in Launceston on Sunday night. 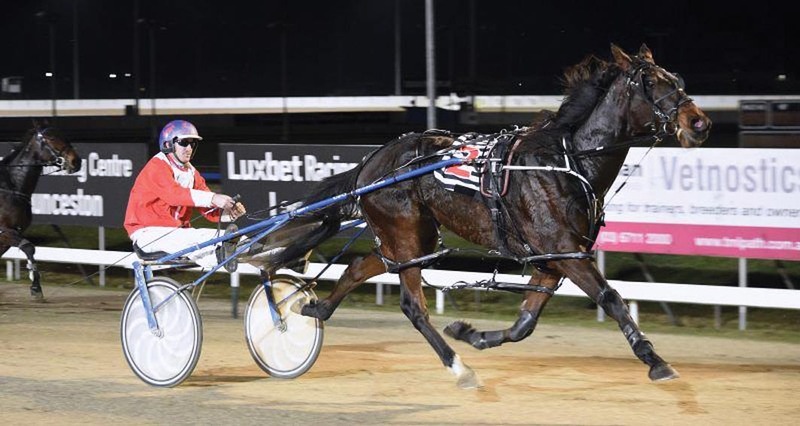 In what is likely to double as his last start in the state, Harjeet will have to overcome a 30-metre back mark in the Easter Cup. The Todd Rattray-trained son of Rocknroll Hanover captured last season’s edition of the Group Two from the front line. Along with the handicap, Harjeet will also have to navigate 13 rivals. While he has all but conceded defeat, Rattray believes Harjeet – which finished fourth in his heat – can emerge triumphant given the right circumstances. “It will probably be too hard from there, but hopefully the race works out better than his heat,” Rattray said. “I really wanted to sit him up in the heat but he had to do all the work three-wide again. “I’m more than happy with his condition as he has pulled up well enough and is bright in himself. Citing Victorian raider Franco Tristan as the one to beat, Rattray also rates local star Ryley Major has a strong chance. Successful in his qualifier for master horseman Gavin Lang, Franco Tristan will begin from the 10-metre line. Drawn alongside Franco Tristan, Ryley Major suffered his first defeat since returning from injury when second in his heat. The Rohan Hillier-trained gelding is predicted to improve for the Final. “They all have claims really, but Gavin and Rohan’s horses are going well,” Rattray said. “It’s a tricky race and it wouldn’t surprise a lot no matter who wins.